East San Jose Mayoral Candidates Debate – District 5 United! 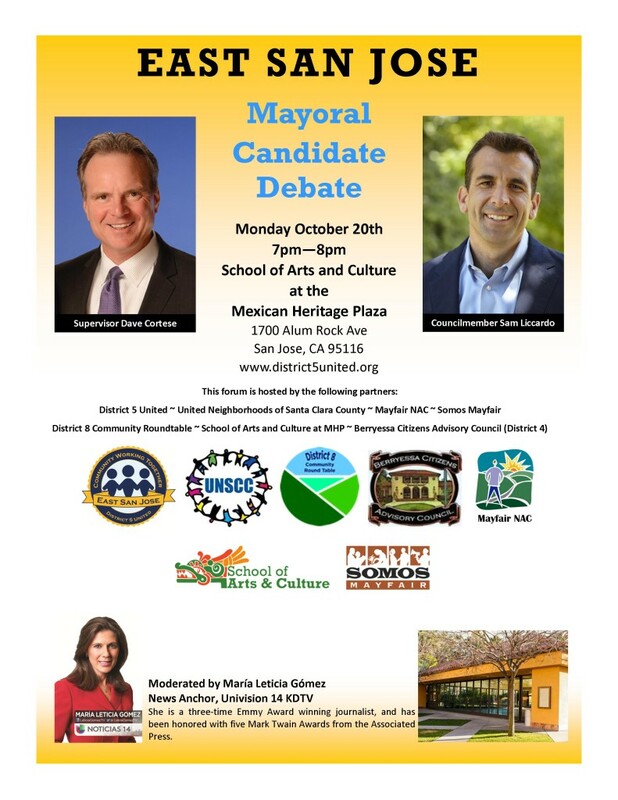 The East San Jose Mayoral Candidate Debate will be held on Monday, October 20, 2014, from 7pm-8pm at the Pavilion at the School of Arts and Culture at the Mexican Heritage Plaza (1700 Alum Rock Ave, San Jose, CA 95116). SURVEY: SUGGEST A QUESTION FOR THE EAST SAN JOSE MAYORAL CANDIDATE DEBATE or CITE A CONCERN TO SHARE WITH THE CANDIDATES: This survey is an opportunity for any San Jose resident or business owner to provide a suggested question for the debate or cite a concern to be shared with the candidates. This survey ends at 1pm Pacific Time on Tuesday, 10/14/14. Click HERE to take the survey.